Road America: A Legacy of Speed | Hupy and Abraham, S.C.
Road America in Elkhart Lake is widely considered one of the world’s finest and most challenging road racing courses. In the early 1950’s, Wisconsin state legislation banned road racing. In response to this, a group of local citizens, combined with the Chicago Region Sports Car Club of America (SSCA), came together to develop plans for a permanent racecourse. Five hundred and twenty-five acres of Wisconsin farmland were bought shortly thereafter, and the history of Road America began. For the first time this racing season, Hupy and Abraham will be a contributor to that history. By 1955, the track’s first SCAA national race was held, and a legacy of racing was born. Today, Road America attracts roughly 800,000 visitors per year while featuring over 425 events, often with several on the same day and many broadcasted worldwide. The original configuration of 4.05 miles sweeping roadway and 14 technical turns have been maintained, and demand the respect of all who take on the track. Racing isn’t the only event featured, however. Everything from go-cart racing to vintage events and charity bicycle rides are hosted at Elkhart Lake during the season. This wide variety makes Road America a mecca for all fun things on wheels. 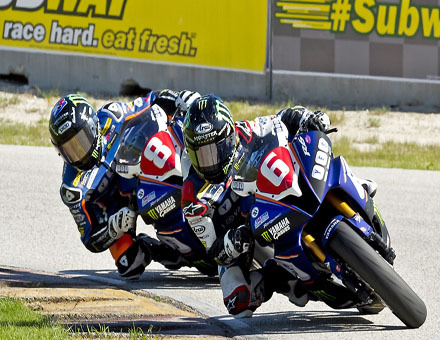 This year, Hupy and Abraham will be sponsoring one of Road America’s most exciting motorcycle racing events, the MotoAmerica AMA/FIM Superbike Doubleheader. With an average attendance of over 20,000 people, it is the largest motorcycle race of the year for the track. As if watching superbikes tear around at record-breaking speeds wasn’t enough, the race weekend roster currently includes a stunt-bike event and general public paddock access as well. Motorcycle awareness is a message that is important to every type of rider. Starting on Friday, May 29, and running through Sunday, May 31, come and meet Hupy and Abraham at Road America. We will be promoting our “Watch for Motorcycles” awareness campaign in the competition paddock, and offering a full line of motorcycle awareness materials for the racing crowd. We hope to see you there!